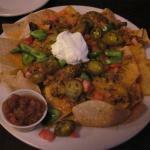 Description: Since 2002, Malone's Tavern has been fulfilling it's mission of providing great food and excellent service in a fun yet relaxing atmosphere. The word is out about our fabulous homemade meals, ice cold beer, daily specials and friendly service. 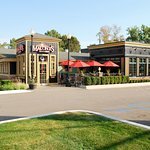 Malone's Tavern is designed to be a place where people of all walks of life gather, in good spirits, to relax and share the news of the day. 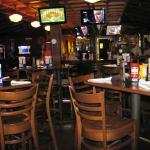 You can catch your favorite game, enjoy a delicious meal and have a ice cold beverage. 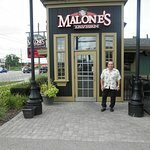 After years of success, Malone's expanded with an open-air, nonsmoking room with an attached outside patio. This addition makes us the perfect gathering place for your family or friends to celebrate events from office parties to wedding rehearsal dinners and everything in between. 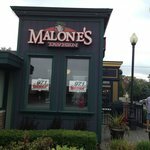 Stop in at Malone's and become part of the Buzz!! Good service at resonable prices..very clean,good service. Really a great place to hang out with friends for a while and the Beer selection as well as food is top notch. The Wife goes there twice a week with friends after working out. 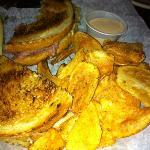 I enjoyed the Rueben and my wife had the garlic mushroom burger. Tried local craft beer and then ordered a flight to sample several more. My wife has a seafood allergy and had to avoid all fried items on the menu since they didn’t have separate fryers, but managed well with her burger and grilled red potatoes. Service was very attentive and polite. 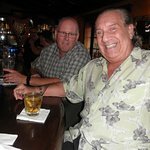 Great food and bar atmosphere!.. We were seated right away. 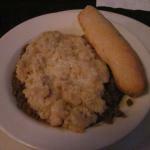 Waitress was very friendly and helpful with questions regarding the food. Will go back again!!! My friend and I were in town for work and we stopped for dinner. We enjoyed it so much and in particular the steaks are very tasty. The staff is great!! 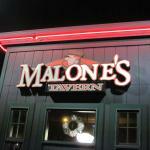 Been to Malone's Tavern? Share your experiences!